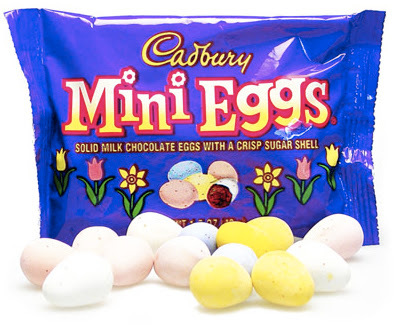 Dear Cadbury Mini Eggs, | Separated by a common language. You are so crazy delicious I don’t know what to do with myself. In fact, you are so good that I would have “relations” with you, if I could. Maybe it’s the delicious chocolate, maybe it’s the crisp sugary shell. All I know is that they have started selling you at Macs again and I am probably going to single-handedly support the Cadbury empire by buying as many bags of these little bastards as I can. It’s like I murdered a baby bird but instead of being covered in gooey chick embryo I am rewarded with hot chocolate. Oh Lord, it is a cruel world you have crafted. Yeah it really takes the fun out of drinking embryo, but I’ll take it. NOTHING takes the fun out of drinking embryo. Not even when bits of umbilical cord get caught in your throat. I actually just responded to a comment on my blog with the proposition of making mini-eggs into their own separate food group. Want to start a petition to the Canada food guide? Ha! I LOVE those too! oh my lord! it’s really that time of year again! i love love love those damn eggs! yay!!!!! i can almost taste the sugary coating and the creamy chocolate inside. mmm….. i think i’m going to have to run to the store and get some before the end of the day.